Bruce Damer told the audience about the gems in the archive. I’m kind of a newbie. I’m one of the tech nerds. Many of you know me as a pack rat of Silicon Valley. I archive and collect stuff, and I have a big Digibarn Computer Museum with a lot of stuff, and I love to tell other people’s stories, and just to give you an idea, when Denis unlocked the storage lockers with the archives in them, and she rolled up the drawer and went in there and it’s like, my archive brain started to go. And the first box I saw said “Trips,” and I said to Denis “We shouldn’t open that box, right. Purple Haze may come out of this box. And he said no no, that’s Amtrak tickets and that’s Passports and stuff.” Ahh, darn it. Don’t open the trips box at the Leary archive! Just to give you ideas of some of the magic and the power of this material. There was another box we opened up, and in it was Tim – Tim’s face, the Death Mask, and many of you might have seen it on CNET. 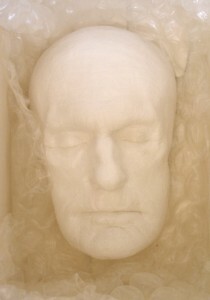 The Death Mask is in a Tiffany box. I don’t know why, but there it is, and wrapped around it was this scarf. And Denis said “This scarf’s never in here.” What was it doing wrapped around the death mask…and I said I know, Tim’s spirit sucked this scarf right up into that Tiffany box and wrapped it around, because this was one of the scarfs he was wearing just before he died. He had a jacket like this. And so, she handed it to me, and said “it’s obviously for you to take on the road, cause you have all these black and white clothes.” And today I didn’t wear black and white. I thought I would sort of psychedelic it up here a bit. And so, I’ve been taking this all over the world. When I give talks, I’m wearing this, and, Tim’s traveling. So, this allows me to tell people about the Leary archive, and take Tim with me. Anyway, some of the other boxes…Some of the magic. One of the boxes that I opened up was of Lorenzo Haggerty, who does the Psychedelic Salon podcast, and I said (gasp) There it is: IFIF! On this little sort of rat-eared folder. That stood for International Federation for Internal Freedom. And we pulled it out, and absolutely what it was, it was the trip reports, it letters that they were sending from Harvard to arrange to fly to Mexico to try Psilocybin mushrooms. It says “Alpert,” who’s “Ram Das” now, “350 micrograms, notes. 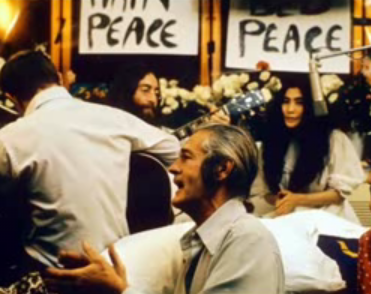 Leary, 450 micrograms, notes.” And I thought “these are their first trips.” Amazing stuff. Of course, Tim’s ashes are in there. You can hold them. Tim’s high school newspaper is in there showing that he was Editor of the newspaper in 1937. His baby pictures are in there. There’s a letter from John Lennon in there, and its, get this, for you Beatles memerophiles, the letter says, and I can’t do the Liverpool accent, “Dear Tim, Thank you for coming to our love-in thing last week. You look fabulous.” And actually there’s a photograph of Tim sitting on the bed with Yoko and John. So, I just want to invite you to consider, if you’re out there. If you have a large property with acreage, and you have spare buildings on your estate. What a wonderful thing to have, to house this beautiful material that is so compelling, and give this museum a great home. And what better place than in the Bay Area? But there’s some amazing stuff. There are lawsuits to the Superintendent of Folsom prison. Tim was filing lawsuits while in prison. There’s a great big canister wrapped in leather that is the film shot of while he was prison at the time. It’s just amazing stuff, and he collected everything. I mean there’s tons of letters from Allen Ginsberg, there’s letters from the Pythons (members of “Monty Python’s Flying Circus”). It’s not just Tim’s life, it’s the intersection of all of this stuff coming in and going out, from 1920 to 1996. This entry was written by lisa, posted on March 21, 2009 at 5:50 pm, filed under IFIF, Tim Leary Archives Party - Feb 2009, Videos and tagged ashes, bruce damer, death mask, john lennon. Bookmark the permalink. Follow any comments here with the RSS feed for this post. Post a comment or leave a trackback: Trackback URL.